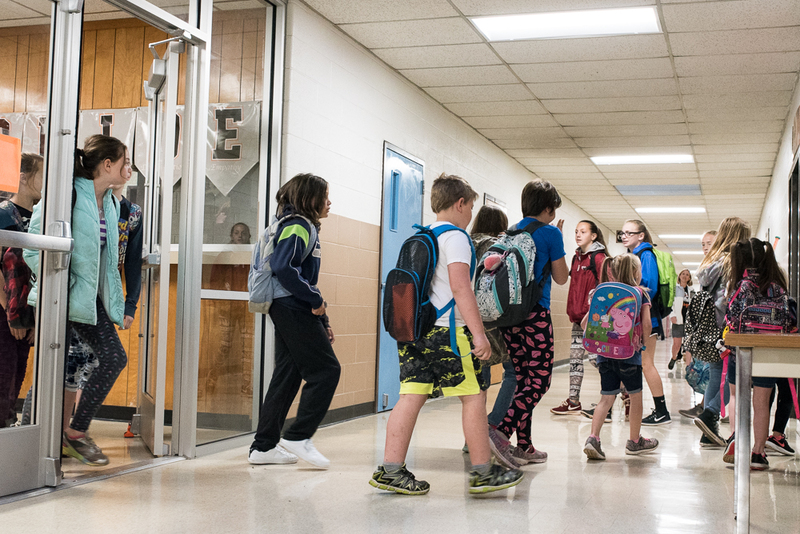 Students enter Lexington Elementary School on April 13 after the school was closed for nine school days during the teacher walkout. In just three months, state officials have already given emergency certification to 2,153 teachers who haven’t obtained certificates in the subject they will teach –surpassing the record from all of last school year. Some are certified to teach another subject area, but many have no classroom experience or training at all. Some examples from the 2018-19 school year are a candidate with a bachelor’s degree in leisure studies applying to teach early childhood education, and another with a bachelor’s degree in criminal justice degree who applied to teach physical education. A well-qualified, effective teacher is the most significant influencer of student learning, and under-qualified teachers are 25 percent more likely to leave their school, according to the Learning Policy Institute, a nonprofit research organization whose focus is teacher shortages. Teacher turnover is highest in high-poverty schools, research shows. State officials have issued 2,852 emergency teaching certificates from June through December for the 2018-19 school year. That number exceeds the record from all of last year. Find out how many emergency certified teachers were approved for your school district or charter or private school. Teacher shortages are occurring across the country, and Oklahoma is not the only state looking for answers. The problem boils down to this: Demand for teachers is growing as student enrollment is increasing and teacher attrition remains high. But the supply is shrinking as fewer people are entering teacher preparation programs. Here’s a look at strategies Oklahoma and several other states are using to address the issue. Emergency certified teachers have become the face of the teaching shortage in Oklahoma, and their use as a stopgap measure has expanded significantly. Arizona’s use of untrained teachers is astonishing. The state has issued nearly 7,200 certificates to individuals without formal training since 2015-16, a 400 percent increase over three years, according to the Arizona Republic. The requirements to teach were lowered in 2017, and applicants now don’t need formal training or a bachelor’s degree — just five years of experience in the subject matter. The most significant thing Oklahoma has done to address the teacher shortage is by raising salaries. State lawmakers this spring raised educators’ minimum salary schedule by an average $6,100; support staff also received a raise. The raises were passed just before a teacher walkout lasting nine days. Similarly, West Virginia, lawmakers approved a 5 percent teacher pay increase after a nine-day walkout shuttered schools across the state. South Dakota in 2016 approved a half-cent sales tax increase to fund teacher salaries, and the infusion of funding pushed average salaries there up nearly $5,000 between 2016 and 2017, according to the National Education Association’s annual report. Educators say the strategy works, though it can take time and is not the sole solution. Higher salaries attract more applicants, and a larger applicant pool leads to an increase in the quality of new hires. Related to salaries, some states offer diversified pay, which boosts pay to teachers who staff high-need schools or shortage-prone subject areas, or they offer pay-for-performance programs. Colorado offers both, and some districts have incentives built into their pay system. Denver Public Schools increases teachers’ compensation for demonstrating student growth, working in hard-to-serve schools or difficult-to staff-subjects, and for other reasons. The district says teachers earn an average of $5,000 above what they would under a traditional salary schedule. However, union leaders have criticized the system, saying teachers want a more predictable pay schedule, according to Chalkbeat. Another example is Arkansas, which offers teachers stipends for training in subjects like computer science. Another strategy some states are using is loan forgiveness programs, which recognize that future teachers incur debt in college that they may struggle to pay off after graduation. These programs are often similar to incentives used to recruit and retain medical professionals to fill needed positions. North Carolina incentivizes teachers who go into special education and subjects related to science, technology, engineering or math. The loan forgiveness can be up to $33,000 when they commit to teach for eight years at any North Carolina school, or four years at a low-performing school. A study of the program found participants had higher rates of retention and were more effective educators. A similar program in Oklahoma is the University of Oklahoma’s debt-free teachers. Graduates are eligible for loan forgiveness of up to $5,000 per year for up to four years if they remain in Oklahoma and teach in a high-need area. To strengthen the teacher pipeline, states such as Arkansas have developed grow-your-own programs. High school students in the Arkansas Teacher Cadets program take a course that educates them on how to be a successful teacher and encourages participants to consider teaching as a career. A program in Washington with private funding from the Gates Foundation supports seven districts in an effort to build a sustainable workforce pipeline. Principals play a key role in addressing teacher shortages, the Learning Policy Institute has found, and schools led by quality principals lose fewer teachers to attrition. Some states have turned to these key school managers as a way to address teacher shortages. The Tennessee Department of Education in 2017 began a $1 million grant program for schools with “innovative and high-impact leader programs.” The funding is to train a total of 160 aspiring school leaders using federal funds. The grant program builds on earlier efforts to improve the state’s pipeline of transformational school leaders. No single policy will solve teacher shortages, the institute says, and states should take a comprehensive approach. “If we could stem attrition and bring teachers in the right way, with adequate preparation and mentoring and reasonable compensation and working conditions, we could solve teacher shortages,” said Linda Darling-Hammond, president of the Learning Policy Institute, which released a new report on teacher shortages Aug. 29.